Broadstreet Video, Text, Popup, Banner, Email advertising network details. 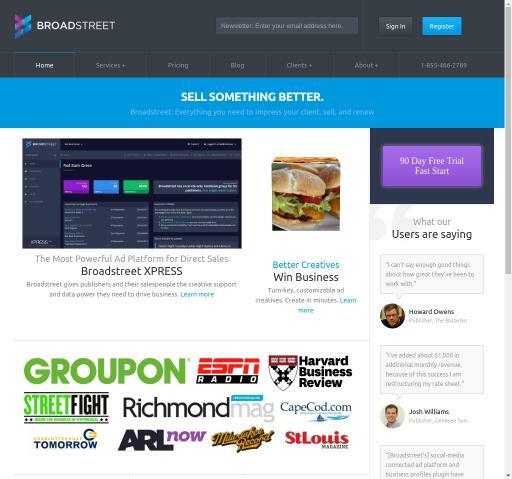 Broadstreet is an Adserver for Direct Digital Sales that uses City Magazines, Industry Magazines and Local News in order to help their publishers to maximize revenue and advertisers to have perfectly designed ads. With a user-friendly platform, Broadstreet has an operations guru that guides you through the process of creating and running orders. Broadstreet has a responsive support team available 24/7 that aims to help you with any issue or question you have. For additional information before registering on the Broadstreet platform, see the Information section to find out what Pricing Models they offer, which are their Targeting Options and Advertising Formats.